By being implemented in Java, Athena should run as soon as a Java runtime is available on your computer. Athena uses the newly introduced Java 6 scripting API. Check the version of you Java runtime by typing java -version. Download the archive (<130Kb). It contains the necessary jar files and an image. 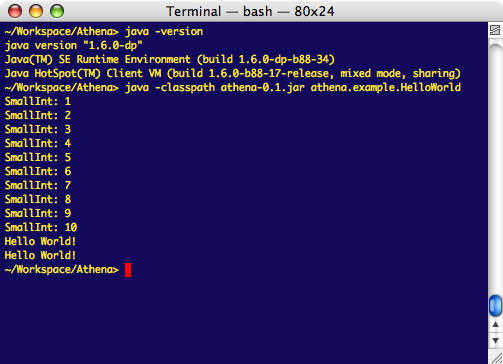 If you're using Java 1.6, then just download athena-X.Y.jar file and the image. Two files need two files, athena-X.Y.jar and Athena.image. These files are contained in the archive .zip file. 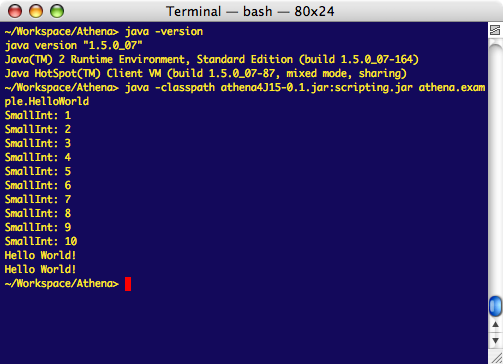 Then the jar file athena4J15.X.Y.jar has to be used since the class format changed between Java 1.5 and Java 1.6. The same Athena.image file provided above has to be used. A set of scripts may be downloaded or browsed online. The complete source code is available in a .zip file (<100 Kb). The archive is also available locally. A convenient way to use Athena shell is to use this script. Edit it using a text editor and adjust the Athena installation directory. Adjust your PATH variable as well. Running this script will open an Athena shell. The command line you provide to this script are passed to the Java virtual machine when the shell is launched. You may therefore use athena -f yourscript.st . It uses the default image (Athena.image).